As part of its efforts to rebuild Apple Maps "from the ground up," Apple has been collecting street-level data with LiDAR-equipped vehicles for over three years. Apple also deployed employees wearing LiDAR-equipped backpacks to collect pedestrian-based data starting in California late last year. 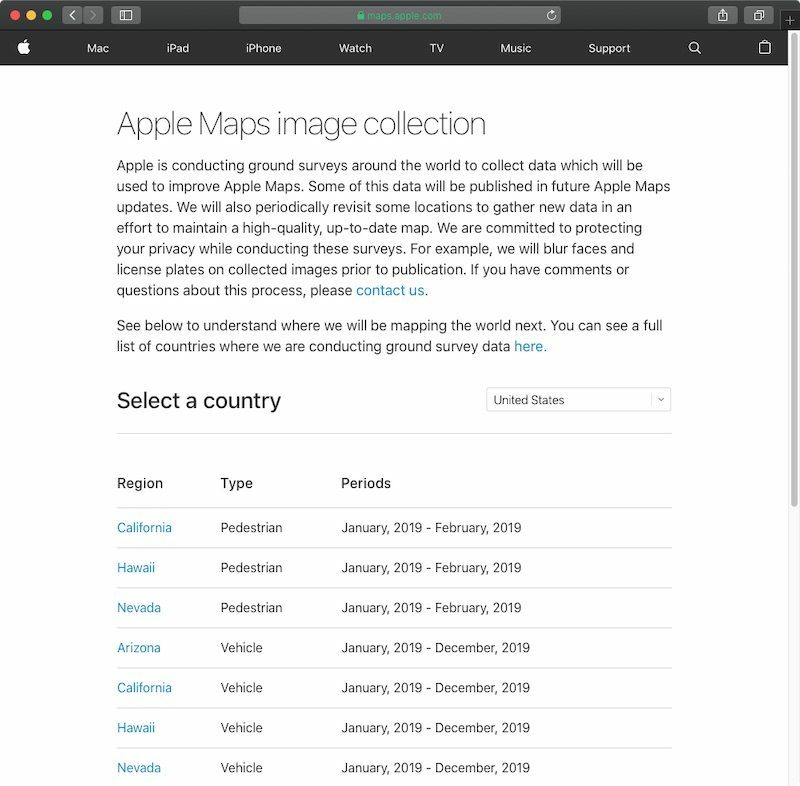 As these efforts expand around the world, Apple recently transitioned to a revamped Apple Maps image collection website with a list of locations it will be surveying both in vehicles and on foot in the upcoming months. The page reveals a few new pieces of information, including that pedestrian-based data collection has expanded to Hawaii and Nevada through February. Vehicle-based data collection will also be expanding to the tiny European country of Andorra, landlocked between France and Spain, in April 2019. The new page, which replaces the previous Apple Maps vehicles list, also indicates that Apple will "periodically revisit some locations to gather new data in an effort to maintain a high-quality, up-to-date map." Apple Maps vehicles have been collecting mapping data in the United States since 2015, with over 45 states at least partially surveyed to date. The vehicles have also surveyed parts of Croatia, France, Ireland, Italy, Japan, Portugal, Slovenia, Spain, Sweden, and the United Kingdom, according to Apple. 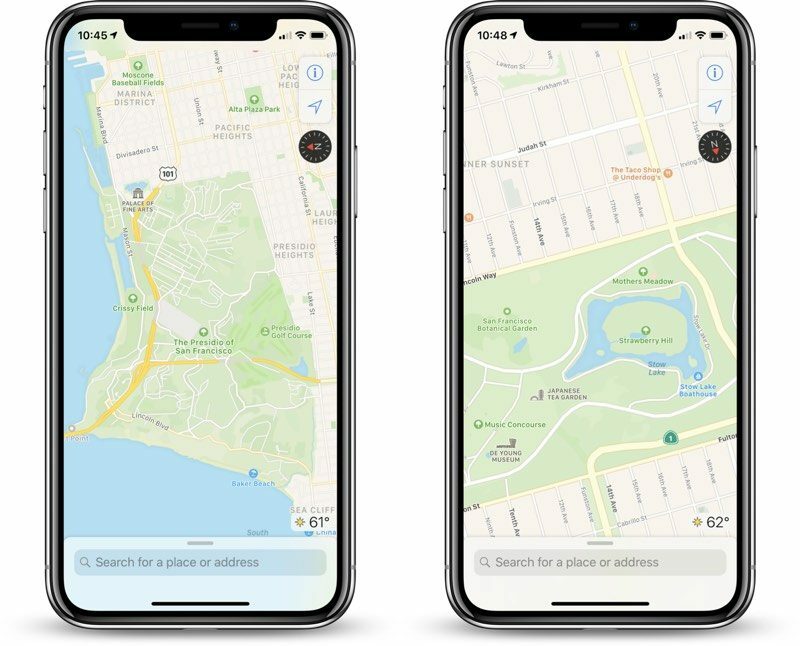 Back in June 2018, Apple said the revamped mapping data would roll out section by section across the rest of the United States over the following year. The improvements first rolled out in Northern California in iOS 12 and have extended to Hawaii and Southern California over the past few months. The overall look and feel of Apple Maps is mostly the same, but zooming and panning reveals more details like grass, trees, sports fields, and parking lots. Apple also said search results would become more relevant. Apple also deployed employees wearing LiDAR-equipped backpacks ('https://www.macrumors.com/2018/10/12/apple-maps-san-francisco-survey-on-foot/') to collect pedestrian-based data starting in California late last year. Still not entirely convinced those weren't inventors disguising their jetpacks by slapping an Apple Maps sticker on. If only they had something similar to Street View coming out. Maybe call it Eye level or something. I earnestly tried Apple Maps a couple years ago and it often would ignore portions of main roads thereby sending me on circular back-country journeys. Every time I used Apple Maps something strange would happen. I gave up and went back to using Google Maps. Navigation accuracy is more important than streetscapes. As a map geek i love this. Me too. This was a fascinating dive into Apple Maps and Google Maps -- and specifically the latest detail updates to Apple Maps. Definitely confirms what I've generally experienced: Apple Maps is getting quite good for wayfinding, but lags Google in place and business labelling. Looks like this guy posts about once a year on the topic of digital app-based maps -- wish it was more! Anyone know how to get one of these mapping jobs? I don't get it how Google had good maps years ago even in countries where English is not the default language. That means they have to deal with different alphabets and they were getting the names correct ! Because they purchased the data from a different, probably local supplier, rather than TomTom? Thanks for posting the link to the Justin Beirne article. An absolutely facinating analysis of Apple Maps and well worth a read whether you love or hate them. Was Maps rerouting you to avoid traffic? On road trip last year to the American Southeast, we were routed on a big, multi-lane highway but as traffic started to pile up, we were given the option to take a reconfigured route along smaller roads. These options kept coming up, and we kept taking them through all kinds of little back roads. At the end of this 5-hour drive, we arrived at our motel within 30 minutes of the arrival time we were given at the very beginning. I would also double-check that Maps is not set to "avoid highways". On this same road trip, we had a day where we had plenty of time to get to our next destination and set this option and were taken through lots of very beautiful back-country roads. We were told right off the bat this would add 2 hours to our trip but we did it anyway. Obviously not desirable in many situations, but a nice feature to have. In my experience, Apple Maps has been excellent for driving and transit in the portions of the US I've used it in (Northeast, Southeast, Pacific Northwest, North and South California) and even in parts of Europe. What it has NOT been as good at is finding businesses. That's where Google still has a huge edge.